It’s getting closer. The big date, I mean. You know, the date! The one on which I board a flight from New York City, wing my way out to California, and then stay there. Like, for good. March 5th is that date, and there are signs everywhere telling me that it’s just around the corner. Signs like a wine- and pasta- and wine-filled going away party. Extra tight hugs. Empty shelves. The stack of brown cardboard boxes cluttering my apartment, and the men here to load them into a truck and move them across the country. Just a few signs. As the date approaches, I’m getting antsy. Excited. Nostalgic. Hungry. On the subject of dates and excitement and hunger, I’d like to tell you about these date bars. I’ve been on a date kick lately; it seems I buy a new carton every time I’m at the grocery store. I enjoy them, roughly chopped atop my cereal or oatmeal, or else straight from the carton; I rip each soft, sticky date open, wrest out the almond-shaped pit, and pop them, one after another, onto my happy tongue. 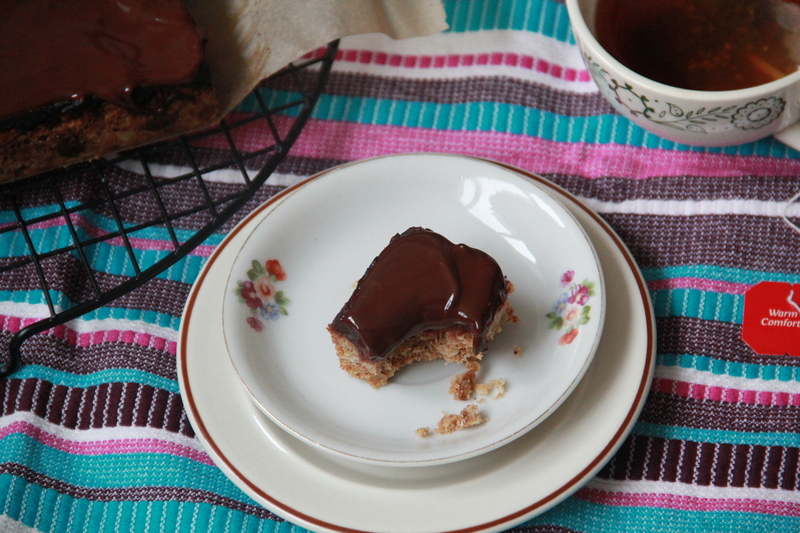 When the urge to bake something with my weekly carton of dates hit, I was initially reluctant to go with date bars. Date bars sound more like health food than dessert. But, after some thought, I reconsidered. 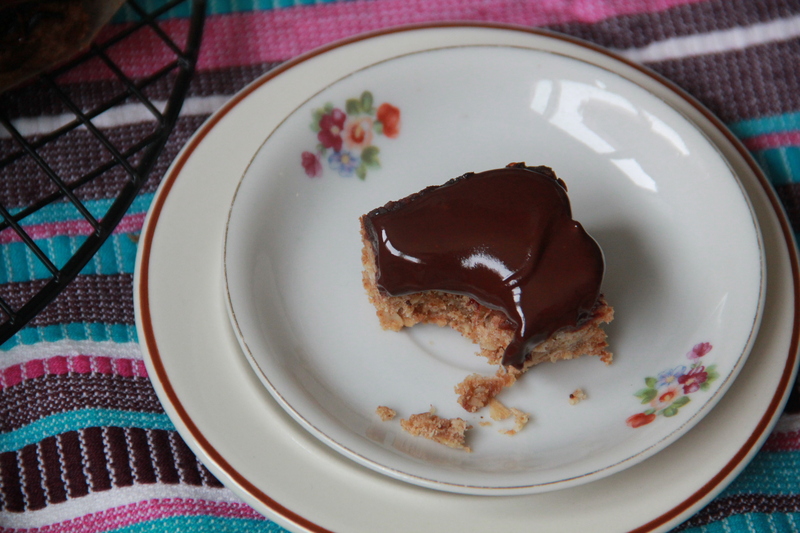 I decided that, if I add some thick, rich and chocolatey ganache to my date bars, already filled with crunchy, oat-y cookie and creamy, naturally sticky-sweet dates, they might be okay. So here’s to move dates and fruit dates, some of which are bittersweet and full of excitement, others of which are covered with chocolate ganache. Preheat the oven to 350 degrees F. Butter an 8×8 inch baking pan, and place a piece of parchment over the bottom and two sides, leaving flaps that hang over the pan. In a large bowl, combine the sugars and orange zest, rubbing together to release the oils in the zest. Add the flour, oats, baking soda, cinnamon, cardamom, and salt, stirring to combine. Mix in the butter, using a wooden spoon or your fingertips to create a moist, clumpy dough. Press evenly into the bottom of the prepared pan. To make the date layer, bring the water to a simmer in a small saucepan. Add the dates and cook, stirring occasionally, until the fruit has absorbed the liquid and the mixture becomes thick and smooth (about 10 minutes). Remove from heat and cool slightly. Spread the date mixture in a even layer atop the cookie dough, and bake until edges are brown and a knife inserted into the center comes out mostly clean, about 35 minutes. Allow to cool completely in the pan on a rack, then use parchment flaps to lift the bars gently out of the pan. To make the ganache, melt the chocolate and butter together atop a double boiler or in the microwave, stirring until smooth and shiny. Add the corn syrup and stir to combine. Let the mixture cool to room temperature, then pour over date bars, using a spatula to smooth. 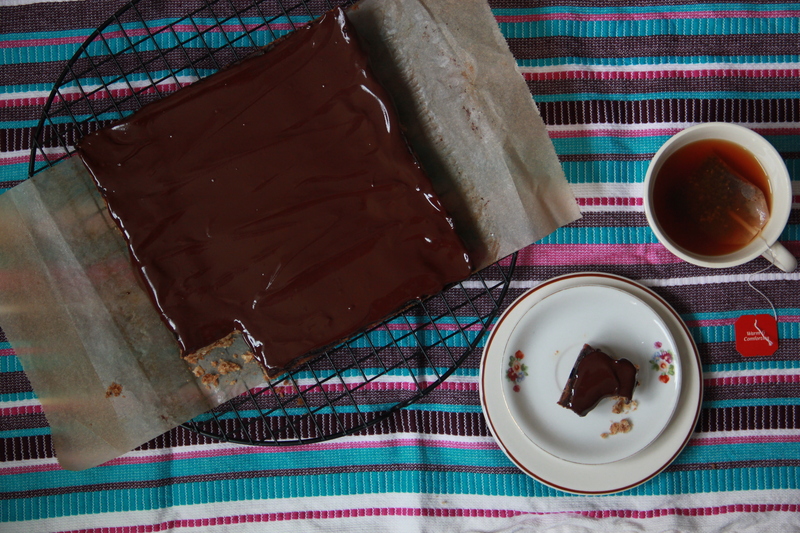 If you can, wait until the ganache sets up a bit before cutting into squares and eating. If you can’t, well, that’s okay, too. Makes about 16 small bars, which will keep for about a week wrapped tightly at room temperature. yum! these look delicious and so pretty! wine and pasta dinner! please don’t leaveeeee. ps. those bars are yumms. That ganache looks so luscious. Good luck with your move! If you need me to come over and relieve you of any leftover food you may have lying around…I’m obviously happy to take anything off your hands.